“Schweres Wasser: Heavy Water” by John Alex Owen begins in a small abandoned town near Berlin at the end of WWII, where a group of SS soldiers are emptying an old factory, and loading a few trucks with sealed boxes filled with secret documents. An SS Captain was ordered to send the convoy transporting the documents to a meeting point where they would transfer the cargo to another truck convoy. He was also ordered to blow up the old factory. The Captain completed his orders and after the convoy leaves, he is eliminated. Once the convoy reaches the meeting point and transfers the cargo to the new set of trucks the soldiers are eliminated by the new soldiers leading the new convoy. This happened again until two officers left alive hid the boxes with the secret documents in a cave on the East side of Berlin as instructed. As the Allies take over Berlin, it has been revealed to the Americans, almost accidentally, that the SS were conducting research about heavy water to develop a nuclear bomb. Thus begins the race of the US to find that research before the Russians get to it. John Alex Owen created an interesting and believable espionage story based on WWII history facts to readers. The beginning is mostly narration and description, which although necessary, made a large portion of the read move slower than what I would have liked. Yet once the main character, Rick Malloy enters the picture, the flow becomes faster and the story more animated through dialogue. I was impressed by Owen’s knowledge of the era, history and geography as it made everything real. It was actually hard to remember that I was reading fiction. 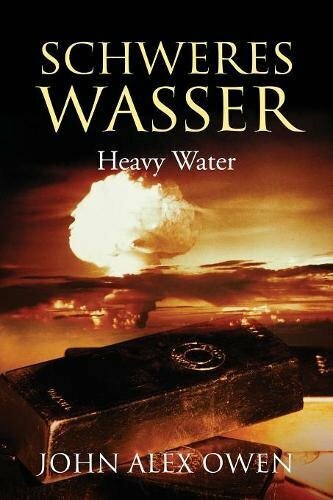 Overall, I really enjoyed “Schweres Wasser: Heavy Water” by John Alex Owen and recommend it to all WWII post war/espionage fans looking for an interesting, captivating, thrilling ride.